We are now Proud Members of the ABRS as of 2019! UPDATE: 1st September 2016 - Just uploaded a newer copy of the price list. we have a new price list, we've increased some of our prices due to rising costs, such as feed, bedding and staff wages. We still offer discounts for regular riders who come weekly or fortnightly. For now though, you can view the new price list in Adobe PDF format. We have attempted to simplify it by having a Childrens and Adult Price list seperate. PLEASE NOTE: The Prices on the individual pages have not been updated yet to reflect the new changes. The prices are subject to change without notice, so please check this space for any updates. Check out our new Pony for the Day website, it has updated information about the activities we offer during the School Holidays! Summer break: Thursday 24 July 2014 to Tuesday 2 September 2014 We will be running Pony Days weekdays throughout the summer holidays, with the main days on Wednesday, Thursday and Friday subject to bookings. 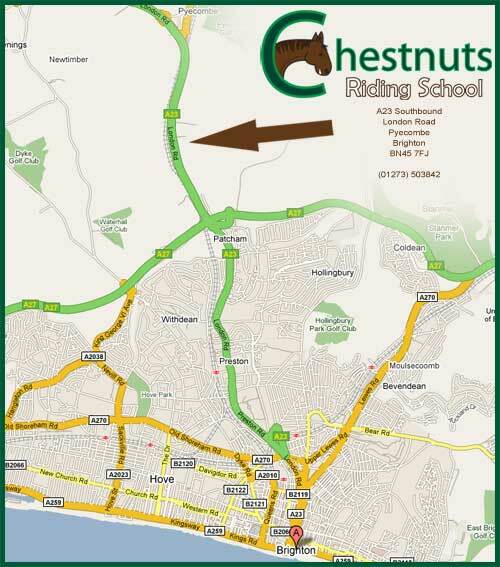 The Chestnuts Riding School is an Equestrian Centre located 5 minutes outside of Brighton on the A23 Southbound. We have a huge floodlit Indoor Arena for year round riding, and the best hacking in the area, with instant access to the South Downs via our Private Bridlepath. The Chestnuts Riding School is fully licensed by 'Mid Sussex District Council' (MSDC), and Insured. Our instructors are fantastic, highly experienced and qualified in teaching "Total Beginners" right up to Advanced level. Trekking (delayed) - Walk Only with Western Saddles and a Pommel to hold onto. Our location is amazing, we're easy to get to, and situated with a direct private bridleway straight onto the South Downs, you can ride past sights like The Chattri/Indian Memorial, Pyecombe Golf Course, even Ditchling Beacon and The Windmills on longer hacks. We're really easy to get to (more info on our location here). When you first start riding is it essential to have your own body protector?